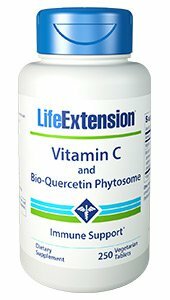 Vitamin C and Bio-Quercetin Phytosome is a high-potency vitamin C supplement enhanced with an ultra-absorb-able form of quercetin. Vitamin C is a powerful antioxidant that also supports immune health, a healthy cardiovascular system, whole body health, and more. Quercetin is a flavonoid that complements vitamin C’s health benefits. And our NEW bio-quercetin is encased in a plant-derived phytosome delivery system, which makes it up to 50 times more bio-available than a dose of standard quercetin. Vitamin C is a powerful antioxidant that provides profound whole-body health benefits. This supplement delivers 1,000 mg of vitamin C, along with 15 mg of an ultra-absorb-able quercetin. Quercetin complements vitamin C’s activity in supporting whole-body health. Additionally, the quercetin in this supplement is encased in a phytosome. A phytosome is a tiny sphere made of plant-derived phospholipids. By combining quercetin with this unique phospholipid-based delivery system, the quercetin in this formula is more easily utilised by your body. Getting enough vitamin C is vitally important for optimal health: this nutrient supports your immune system and helps maintain a healthy heart. In fact, studies have shown that people with higher vitamin C levels are more likely to live longer, healthier lives. Plus, vitamin C’s biological activity is complemented by the health benefits of the flavonoid quercetin. In fact, vitamin C and bioflavonoids are often present together in healthy foods such as fruits and vegetables, notably including citrus fruits. Quercetin has a long tradition of use relieving the effects of seasonal immune challenges. In a randomised clinical trial, quercetin supplementation encouraged a healthy immune response in physically fit older adults. Another randomised controlled trial found similar results in trained athletes. And in double-blind clinical trials, quercetin promoted a healthy inflammatory response, reduced oxidative stress, and helped maintain overall health.